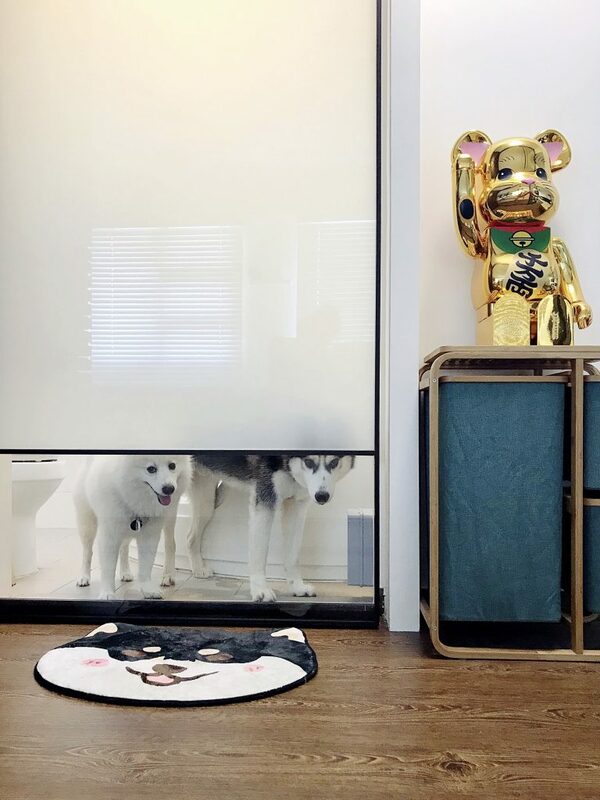 Dogs – The two furry boys obviously do not have a sense of privacy. More often than not, they will either squeeze into the toilet to “accompany” me or demand the toilet door to be open so that they can make sure you are within sight. 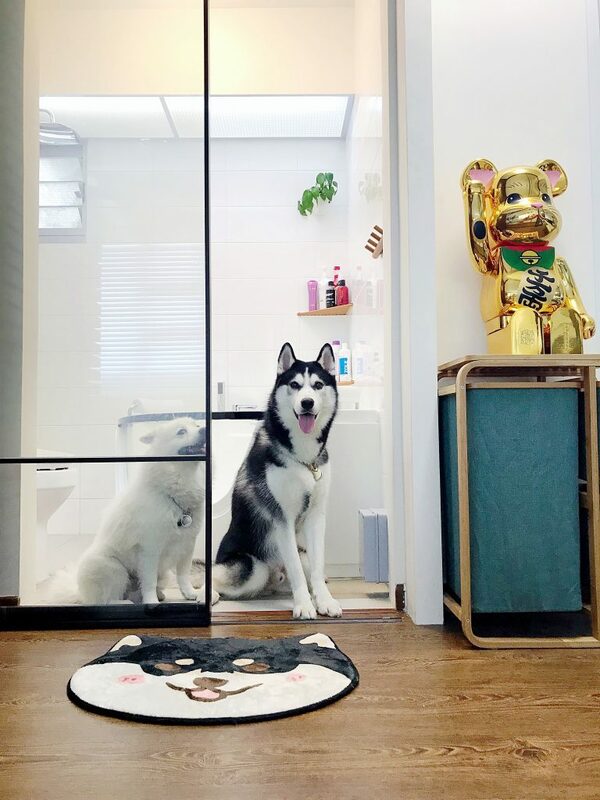 With the clear glass panel at the bottom, it’s just the right height for your furkids’ assurance so that they can “see” that you are safe and not eaten up by the toilet bowl. At the same time, it’s the perfect height to provides privacy with the sliding door fully closed. No one can see you doing your business, lah! Now, get what I meant when I said you have to measure your elevator and stairs for the right clearance size? The shipping crate makes everything much larger, and you need to make sure it fits! The crate for ours was so huge that it barely cleared the height allowance of the walkway too. That’s why it is extremely important to measure the clearance space up to your place, not just based on the size of your item. The awesome staff from Ewins getting my smart glass installed! 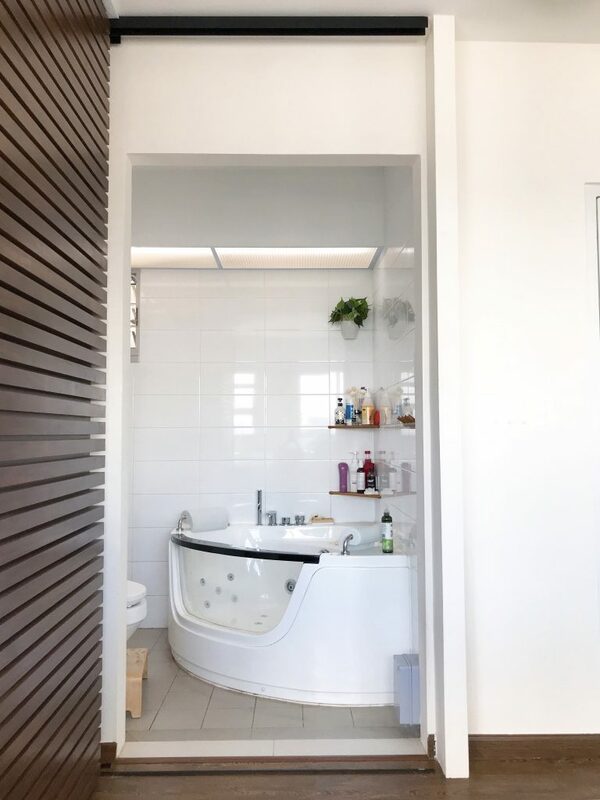 The Raumplus S1200 sliding doors which we used on both our washrooms initially cames with a clear glass panel that could be replaced with one of your own choosing. For our common toilet door, we had that panel changed to the smart glass which we imported ourselves. 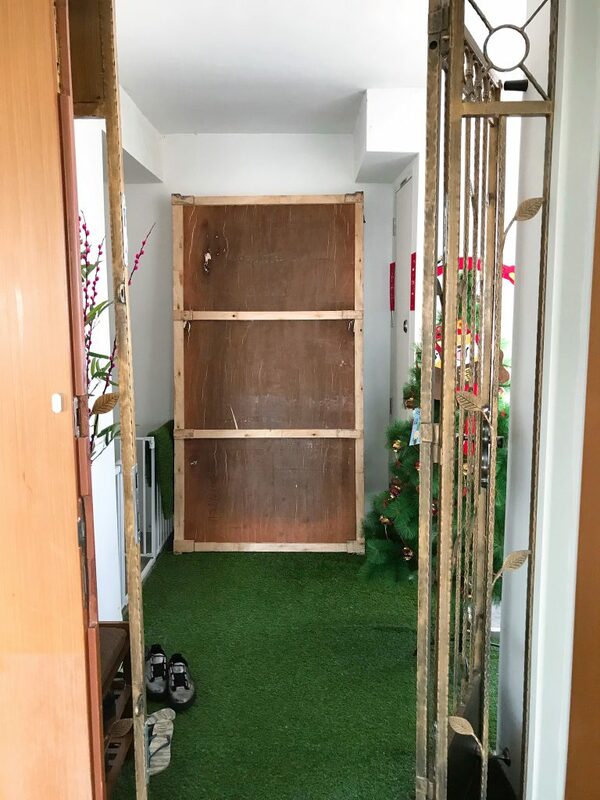 As for our master bedroom toilet door, we chose to upgrade it to a full-height bronze mirror on one side, and a full-height normal mirror on the other. Yup, they can actually squeeze two pieces of panels into the frame! 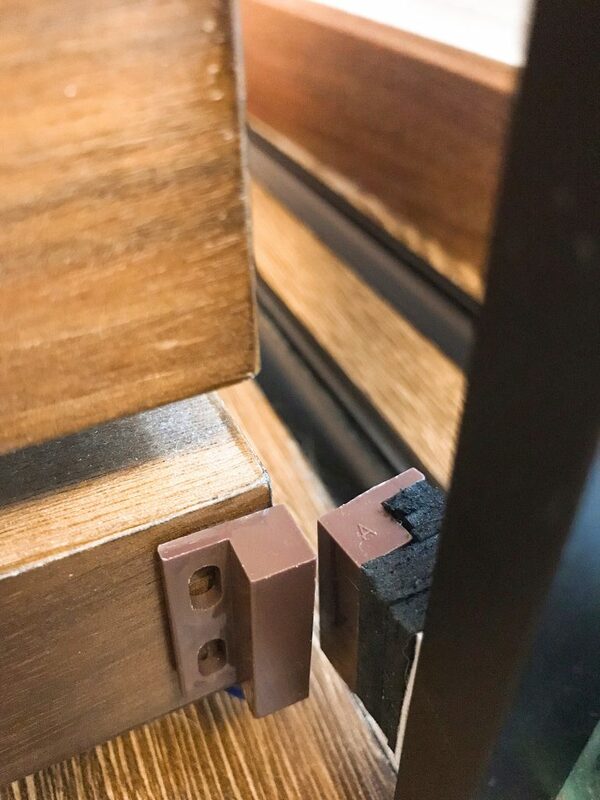 Well, of course, before you actually install the smart glass into the frame, don’t forget to test it out by connecting the wires temporarily to the power supply unit to make sure it works. Our piece had 2 wires per side. The trick is to bundle both wires of the same colour together, and you will only eventually need two wires to make this work! Isn’t that much lower in cost and less labour intensive? OF COURSE WE THOUGHT OF THAT! We even tried it! Technically, the Smart Film works exactly as the Smart Glass. But since you have to stick it on top of the glass, bubbles are introduced when there are foreign objects between the film and the glass. After we stuck the Smart Film onto our initial clear glass panel, we noticed hundreds of air bubbles, dust and fur (well, we have two dogs, you know). Imagine sticking on a screen protector for your mobile phone – but this time round on a 1000x bigger surface area! Yeap, that’s right. Unless you’re going to apply the Smart Film in a 100% dust-free clean room, there’s no way that you can stick such a huge piece of the film perfectly. So, you could probably imagine our horror when we installed everything nicely and our mistake in using the Smart Film initially hit us. The Smart Film was just so uglyyyyy but it works! And after that, it took us quite a while to decide if we should spend the extra bucks just for the pure, clean, aesthetic “look”… without air, dust, and fur bubbles! 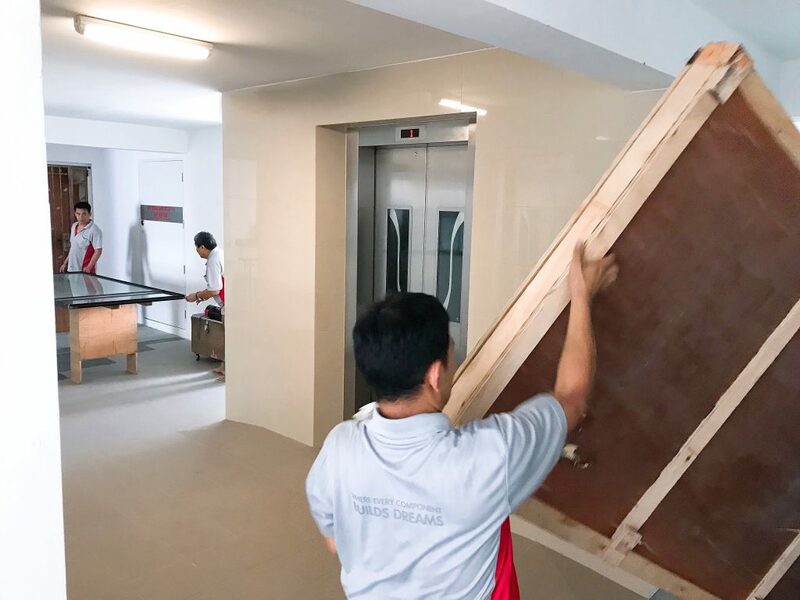 Another reason why we chose Raumplus S1200 track was that it is one of the most beautiful and slimmest sliding doors that comes with top and bottom tracks. It’s no easy feat to install these sliding doors! Even though the Raumplus s1200 sliding door is one of the slimmest in the market, it’s no easy feat to install. There was 1 guy inside the toilet supporting the panel, and 3 guys outside lifting and installing the door. Installing the soft-closing mechanism so that the door doesn’t slam! Oh, and you can opt for soft-closing mechanism near the closing points so that the doors do not slam while being closed. Perfect for lazy people like myself! 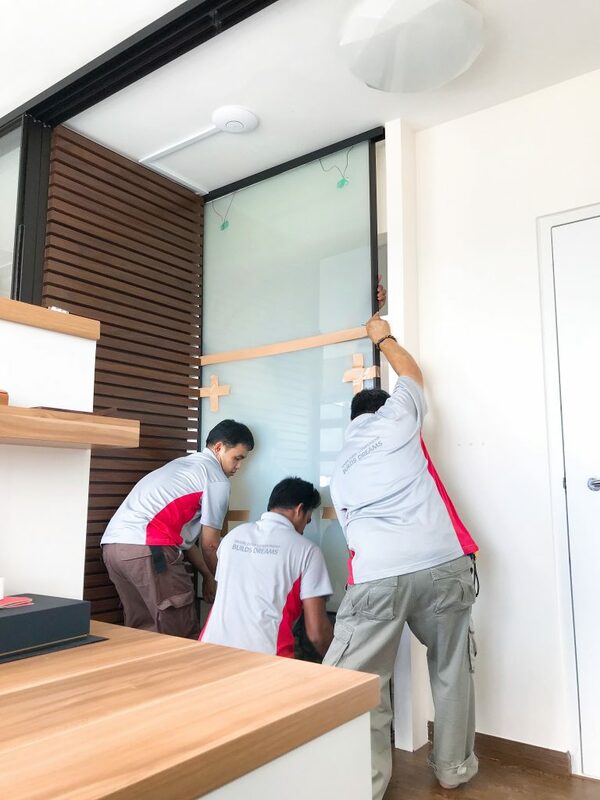 If you actually do your homework, you will find that there is almost NO ONE in the world who has successfully installed such Smart Glass panels on sliding doors. You will see people having it installed on normal hinge-based doors, and fixed panels in partitions, but almost never on sliding doors. This is simply because the wiring is the most complicated part of this whole setup. How exactly, does one transmit the electrical current required to toggle the glass between opaque and transparent? For us, we chose to run a coiled spring-back wire (you know, like a telephone-cord-wire) on top of the glass, behind our divider…. and we installed a magnetic relay/sensor at the bottom of the door to toggle between on and off. Only on the other (back) side can you see the curly wire. It’s mostly hidden for your guests or whoever’s looking at your nice, super-cool smart glass door. Here’s the magnetic sensor/relay which is used to toggle on and off! 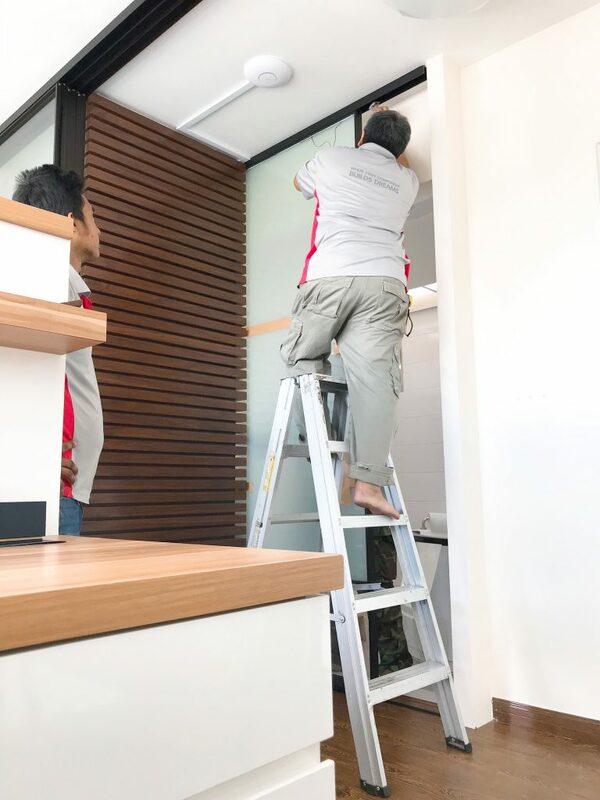 It takes a bit of fumbling and customization, but once you get it right, you will realize that using a magnetic sensor is probably the easiest to toggle off power to the Smart Glass when the door is closed (i.e, flush with the partition). Your own use-case will definitely differ, hence the type of sensor you use might be different too. To be honest, it wasn’t easy getting this sliding Smart Glass to work. As mentioned, we simply couldn’t find anyone who had done it at all. Some contractors and electricians laughed at us and told us that it was impossible to be done. 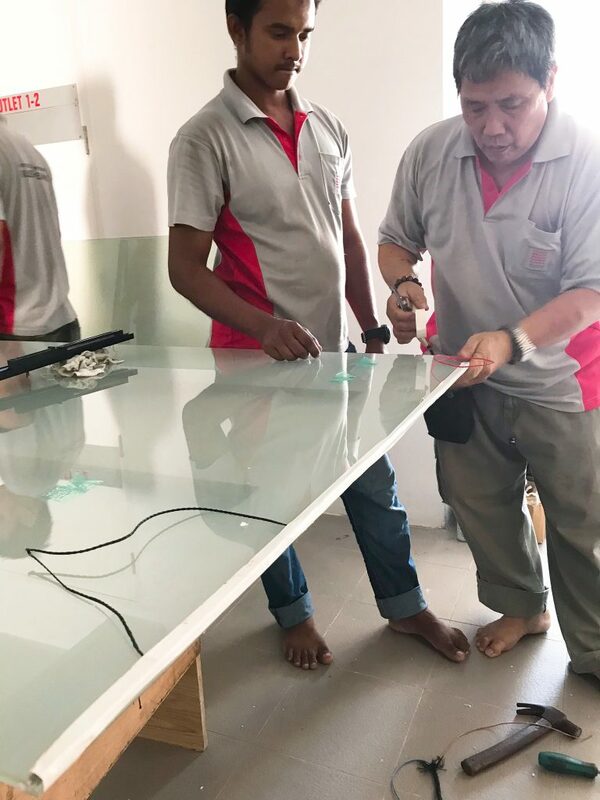 Even local Smart Glass vendors refused to take on our job because they said it was too complicated. 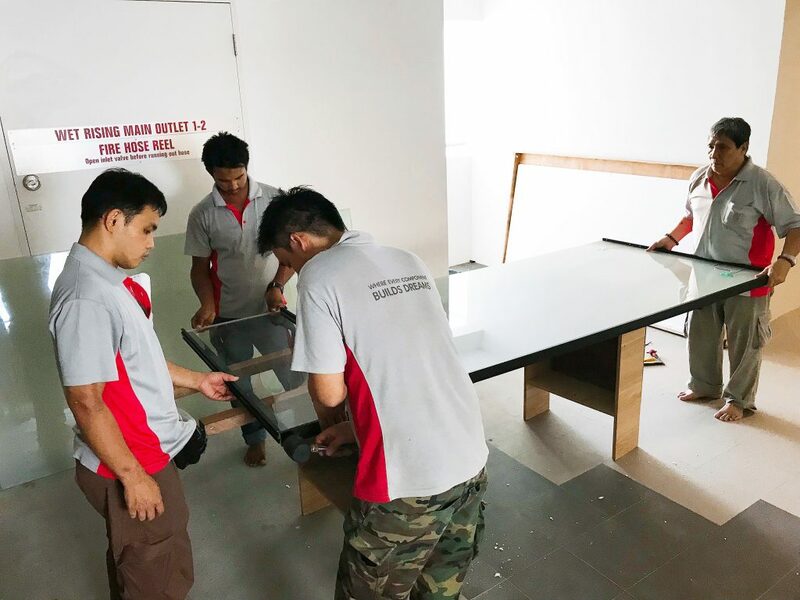 Even for places like high-end offices and hotels, they usually choose to do the fixed Smart Glass panels, instead of movable (sliding) ones. ..which is obviously a much more stable and significantly easier option. No need to worry about sensors and wiring – just control using a wireless remote or switch! 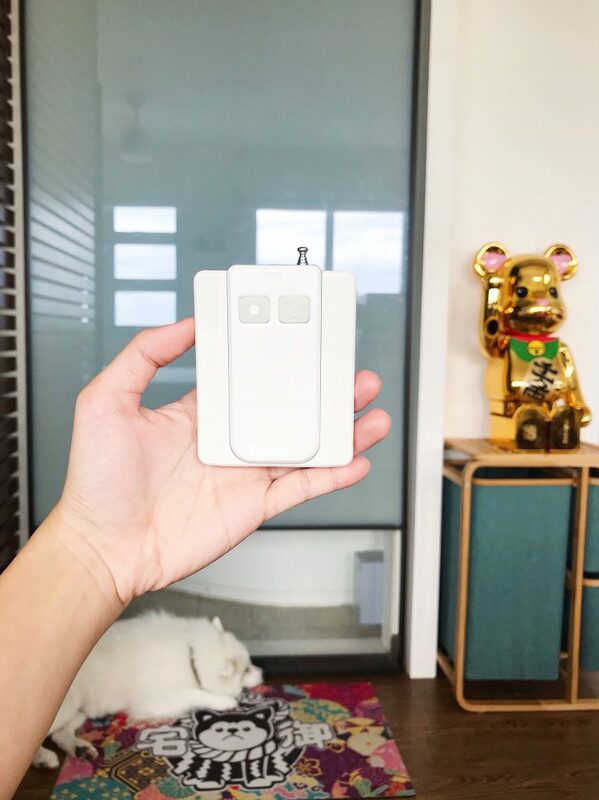 Even though our door doesn’t really require any button-pressing or remote control since we are using the magnetic sensor, we still do have the ultimate “weapon”… the remote control to override the “transparency” toggle of the Smart Glass. Muahahaha.